The City of Buffalo is located between the Twin Cities and St. Cloud on the shores of two recreational lakes, Buffalo and Pulaski. The lakes attracted early settlers as a source of food and recreation and still contribute greatly to the city’s quality of life. During the past 150 years, Buffalo has experienced enormous growth and development. 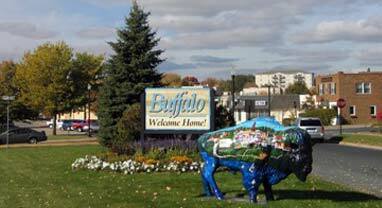 Long known as a tourist destination, the City of Buffalo offers visitors numerous beaches, trails, parks and golf courses. MMPA welcomed the City of Buffalo as a member in 2005. Buffalo Municipal Utilities offers rebates to residential customers who purchase and install new, ENERGY STAR® appliances and lighting. Rebates are also available when you recycle your refrigerator or freezer or tune up your central air conditioner. Applications are available below, on the City website, or may be picked up at the City Office. If you qualify for Energy Assistance in MN, you may be eligible for a free energy audit through the Weatherization Assistance Program (WAP). Contact Wright County Community Action at (320) 963 – 6500 to see if you qualify. Information about WAP can be found here. Buffalo Municipal Utilities offers rebates to business customers who install energy efficient lighting and variable speed drives. See rebate forms for details. Applications are available below, on the City website, or may be picked up at the City Office. For information on Custom projects, please contact Buffalo Municipal Utilities.